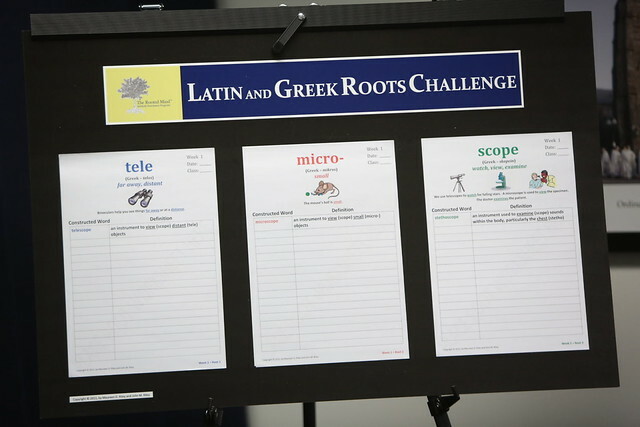 Summary of today’s show: Learning the Latin and Greek roots of English words isn’t just a road map to success, it’s a GPS, said one educator of The Latin and Greek Root Challenge. John and Maureen Riley of Natick have developed this fun program that helps children from kindergarten through eighth grade learn the Latin and Greek roots in a fun and engaging collaborative environment, leading to higher test scores and better vocabulary, not just in English, but in every subject, including science, math, health and religion. 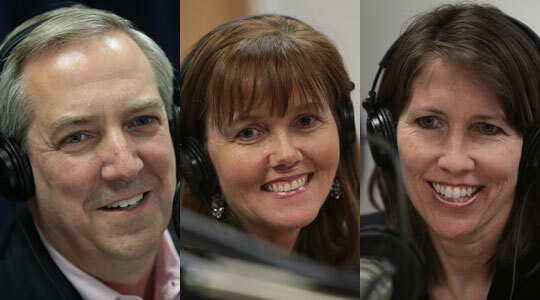 Scot Landry talks with the Rileys and Charlotte Kelly, principal of St. John the Evangelist School in Canton, about the Latin and Greek Roots Challenge, how it works, the benefits it’s already exhibited, and how it’s spread to more than 20 schools in Boston and Chicago. Plus, see how Scot does when he’s asked to take the challenge! 1st segment: Scot welcomed everyone to the show. Today’s topic is the Latin and Greek Roots Challenge which is being implemented in many Catholic schools. But first Scot discussed briefly Pope Benedict’s trip to Mexico and Cuba. The Holy Father arrived in Cuba a few hours ago. Cardinal Seán is also in Cuba to be with the Holy Father and two reporters from the Pilot are in Cuba covering the visit. Scot introduced John and Maureen Riley, the creators of the Latin and Greek Roots Challenge. Charlotte Kelly is principal of St. John the Evangelist School in Canton, which is implementing the challenge. Scot said he heard about the challenge from John in their meetings in the Pastoral Center about the Catholic Appeal. John said this is his wife Maureen’s brain child. He said a lot of educators and parents understand there’s a tremendous value to the classics, looking at the Latin and Greek heritage of the English language. Sixty percent of the words in English have Latin and Greek roots. Scot said it makes you wonder why we don’t spend more time on Latin and Greek in primary education. John said it used to be the case, but that faded away. Science, medicine, and law are even more rooted in those languages. John said they are trying to educate elementary school students and introduce Latin and Greek roots in a fun engaging and school-wide way that helps them understand the meaning of the roots to help them recognize words they might otherwise not know by breaking it down into its roots. Scot asked Maureen how she got the idea for it. Maureen said she’s always had a fascination with education and asked herself how the kids in the inner city schools ended up with lower test scores, but how the schools with Latin in their name ended up with higher test scores. At their children’s school, St. Paul’s Wellesley, parents discussed bringing Latin and Greek into the school, but she didn’t know these languages herself. She recalls seeing a movie about an inner city student who won a big spelling bee by learning how to break down words into their roots. With her own children, she was always going to their teachers to ensure the kids were being challenged. Maureen wanted to find some way to help all children. Finally she woke up one day with the idea for a board that would create a challenge for all the kids in the school. Charlotte said she was sold by the Riley’s enthusiasm when she met them a year ago. They were already doing a vocabulary program and saw how this could fit in. They already teach Spanish in 5 through 8, but they could include this for every grade level. John said it was important for them from the outset that this be a school wide activity, that the kindergartners would get the same roots the middle school students get and it would build community in the school. Kindergartners are being introduced to the whole concept of roots and that’s an important lesson at such a young age. Speaking to a first grade teacher, she told them that words come up in math and science and the students say they can figure out what they mean. There’s a magic and power to words. 2nd segment: Scot said there are 20 total schools in the pilot program, including 8 in Chicago. Four or five more schools have expressed interest for next September. Scot said they have a board in front of him with words on it, including roots of various words, like tele-, micro- and -scope, and tell them what the meanings are. Then they ask them for the subsequent words to make from them like telephone and television. John said they introduce the kids to the roots and their meanings and they ask them how many words they can identify with the root. Then they remind them of the meaning and then present a new word and ask them to define it based on what they’ve learned. Maureen said they also give them visuals, like telling them to imagine looking through a telescope to see things far away. Throughout the week, the teacher has a board to review the roots with photos and visuals to break down the meanings of each root. The children are encouraged to write in meaning of roots as they go. There are three different level workbooks for different grades to slowly go from easy to more difficult, from concrete learning to abstract learning. Charlotte said while many of the young teachers haven’t themselves had classics training, the teachers have picked them up enthusiastically and are now offering their feedback. She related a story of six and seven-year-olds children impressing other teachers on their ability to break down and construct new words. John said he and Maureen have 3 daughters, 10, 8, and 5. They have been the test subjects and they really enjoy it, albeit at different levels. The kindergartner really dives into it. The second-grader and fourth-grader are showing how they can process at different levels and understand the complexity of the words. At middle school, the kids are independently looking up words online and going to the dictionary for words. Maureen said the kids get very creative in working on the words. She works every week with grade two. Each week, they do a quick review. She gives a root and they have to give back the meaning in unison and every week they have it down pat. They also do collaborative learning. They go around the class with a paper to come up with lists of words for that root. Scot said his experience of his kindergartner is that not all of them can read well at that age. How does it help a child learn to read by recognizing roots? Charlotte said they have a pre-K and K level that uses a simplified version that explains root words and the difference from a beginning sound. (T v. tele). Where they are beginning to read, the data shows high improvement across the board. As much as 18 percentage points by Grade 6. Maureen said one parent of a second-grader told her that in the grocery store the children point out Latin and Greek root words. They see a difference in the child’s vocabulary. Scot said kids are natural problem solvers and sleuths. John said part of the fun is that the kids view it as a game. The parents, teachers, and principals have given great feedback. They met the superintendent of the Chicago archdiocese this past summer. Maureen said they had been asked to present the program to Sister Mary Paul, the superintendent in Chicago. She told the sister that it’s almost as if when your child gets to 18 or 22 and going on their first road trip. You give them maps. Latin and Greek Roots are the maps. They don’t tell you exactly where to go, but the tools to get there. Sr. Mary Paul said it’s not a map, but a GPS system. John said most students, except for the youngest, get 3 roots per week over the 25-week program in a three-year cycle. They are also exposed to secondary roots on the constructed word lists that contain the primary roots. Each of those words on the list have other roots as well. They will eventually have a tremendous command of roots. Charlotte said in her 11 years at St. John’s they built up vocabulary programs, especially one from grade 3 to 8. They see this as an addition in order to be able to put words together. Scot asked how important is that these are also words that will help them get into college on the SATs and ACTs. Charlotte said this is a program you don’t to pass up at a reasonable cost. It raises test scores, but it’s also a lot of fun. During the school year kickoff, they had the parents play the root word game. This is a fun way to learn Latin and keep it from being boring. John said in the program development they have researched high frequency standardized exam test words with the goal of ensuring that there is also a value in giving them better scores, making it fun, helping them with their future careers, and score well on tests. Scot said on the SATs, the highest possible score is 800. The average score for those who studied Latin versus those who didn’t study language or studied a different language was much higher. Maureen said they are waiting for the best data on their programs which will be available after 3 to 5 years in practice. Scot said studying Latin helped him in his own studies in geometry. Charlotte said it’s helping them with the study of religion. 3rd segment: Scot said the excitement of learning Latin and Greek words has helped Charlotte’s students incorporate Latin into the fun of preparing for Lent. She said students have learned the Our Father and Hail Mary in Latin. She said it’s helped with vocabulary in religion classes, as well as in health and science classes. Charlotte said this program is a great marketing tool for the school and in their own marketing, they include the Rileys’ marketing materials as well. Maureen said her first dream is to get this program into every single inner-city school in the country to transform them and teach children the love of words. Where scores are dropping everywhere else, the kids using this program are getting better scores. Her second dream is to gather all the statistics to show that this makes a difference, to show that what they believe about it is proven scientifically. Scot pointed out that Maureen never studied Latin, but she was inspired in a way that is helping so many students to learn in a more enjoyable and quicker way. Maureen said she’d always believed that she would work in educating children some day and throughout this process, every time she encountered an obstacle she’d turn it over to God and they would overcome it. She credits God as the inspiration and the assistance of so many people that have helped them from other parents to teachers and principals to other volunteers. Scot said there are a million ideas, but it’s not easy to actually implement it. It’s not easy to get into schools and get onto budgets, whether Catholic or public schools. John said it’s been a rewarding and exhausting experience. He said this is a little bit of the American dream, to have an idea and promote it and encourage others to take it on to help others. It’s also been a labor of love, with a passion for the mission of educating children, especially in Catholic schools. He said Catholic schools are near and dear to their hearts, because they nurture the spiritual life of children. It’s been an adventure and they’ve questioned their sanity at times. Scot said everyone who starts anything gets to a point where they feel overwhelmed or question going on, but to get to the point where it’s implemented and successful, is a massive amount of work. John said you have to be reflective, to look ahead but to look back once in a while to see how far you’ve come. Look at how many children they’ve affected in two years and then look ahead to the potential impact in the future. Charlotte would tell other principals that this is a must have in their schools. She encouraged the Rileys to have a booth at the National Catholic Educational Association convention coming up in Boston in a couple weeks. Scot asked what makes it a must? Charlotte said it’s definitely vocabulary. After testing recently, they are finding scores to be up especially among those taking the high school placement exams. Some students always do even better than the others and it creates excitement around the dinner table. Maureen said they hope that it creates good dinner conversations in the family. The kids find it fun and so they play the root challenge and stimulate further conversation. John said a lot of parents haven’t been exposed to these languages and so they can benefit as well. John wanted to name a number of people who have helped from the beginning of their work and said how much they appreciate the effort and assistance from all of them.